In this epic Biblical narrative, ideal for fans of The Bibleminiseries, a young woman taken into the prophet Isaiah's household rises to capture the heart of the future king. 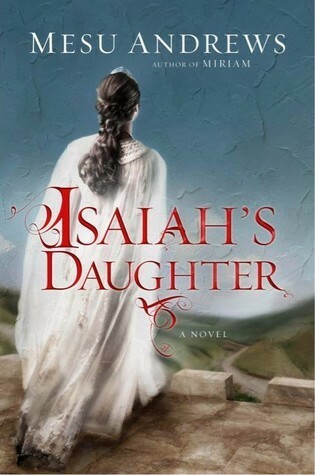 Isaiah's Daughter is a book that you do not want to miss. Oh, this fiction novel is one that will deepen your walk with the Lord as you draw closer to him. His love, justice, mercy and righteousness are displayed in Hezekiah, Hephzibah and Isaiah. I have never studied the book of Isaiah in depth, but this novel made the book come to life, especially as I saw the lives of those who were struggling with the prophecies about the coming of the Messiah. They wanted to know who would be the Prince of Peace? It's so interesting and what what a great perspective to read. It brings the Bible to life on a whole different angle that I had never really seen, but the reality is that God is faithful to his people and that is what is carried throughout. This book is a great reminder that apart from God, we are doing everything in our own strength and it's going to go down bad. We need to fix our eyes on Him and allow God to provide the answers to our problems, not for us to fix them. Apart from Him, we are a mess. This book was a great reminder and was also just a wonderful read. Mesu grew up with a variegated Christian heritage. With grandparents from the Pilgrim Holiness, Nazarene, and Wesleyan Churches, her dad was a Quaker and mom charismatic. As you might imagine, God was a central figure in most family discussions, but theology was a battlefield and Scripture the weapon. As a rebellious teenager, Mesu rejected God and His Word, but discovered Jesus as a life-transforming Savior through the changed life of an old friend.esu writes in their log cabin tucked away in the beautiful Appalachian Mountains. Her best friend is an American Staffordshire Terrier named Zeke, who keeps her company on long writing days. Zeke also enjoys watching movies, long walks in the woods, and sitting by the fireplace on rainy days.